A New Roots Special Report on the First Annual E. F. Schumacher Lectures. Our present agriculture and silviculture practices have created a number of problems which inherently pose life and death questions to communities and the people who live within them. In spite of our seeming affluence in food and wood supplies, we are in a very vulnerable position brought about by a number of environmental, economic and political factors. Yet the recognition of this situation in time could bring about the changes necessary in our food and land use systems that could lead to a truly sustainable economy— “economy of permanence” as E. F. Schumacher envisioned it. Among the factors which are causing this vulnerability are the increasing price of energy to produce and transport the food we eat; the tremendous cost in soil erosion caused by current farming methods; and the increasing size of farms corresponding to a decreasing number of farmers. That combination, until recently, has depopulated much of our rural area with resulting economic decline. While these factors have not yet reached the critical stage which could cripple our ability to supply ourselves—especially our cities—with food, they have already taken a major toll in terms of the alienation, the violence and the cultural wasteland which our cities and our rural areas reveal. Today, many people are working to find ways to return to the land. A new culture is emerging emphasizing gardening, energy-efficient shelter, wholesome food, cooperatives, solar power…. self-reliance in its most basic applications. To affirm and strengthen such a cultural movement, the Schumacher Center of America sponsored its first annual lecture series not long ago at Mt. Holyoke College in South Hadley, Massachusetts. The gathering, People, Land and Community, set out to answer the question of how new farming practices and community efforts could bring about long term institutional changes that could lead to truly sustainable food and land systems. More than 400 people from throughout the Northeast attended; another 200 were turned away because of lack of space. Farmer-poet Wendell Berry (see cover story this issue) and Wes Jackson, internationally acclaimed plant geneticist, were the featured speakers. They were joined throughout the day-long gathering by futurist Hazel Henderson, Kirkpatrick Sale, author of Human Scale, Robert Rodale of Rodale Press and the Cornucopia Project, Ronald Reagan senior policy advisor John McClaughry, Pat Lewis Sackrey, chair of Rural American Women, and Schumacher Center president Robert Swann. The presence of E. F. Schumacher—”Fritz” as Henderson warmly referred to him—permeated the hall. Since his death in 1977, Schumacher’s ideas have taken root in progressive pockets around the globe. The American branch of the Schumacher Center is a new organization working to translate those ideas into policy on the personal and community level. Left: E. F. Schumacher, Right: Wes Jackson. Photo by Dana Jackson. 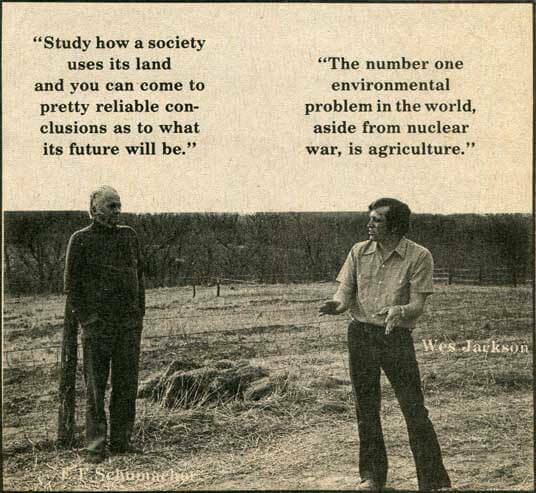 Jackson and his wife Dana are the founders of the Land Institute in Salina, Kansas, a teaching and research institute devoted to the search for sustainable alternatives in agriculture. They advocate a permanent agriculture, and propose scrapping till agriculture in favor of planting mixed perennial seed crops which can be used for food and fodder year after year. This truly sustainable method of farming, Jackson says, will not endanger soil health and stability, water retention or other variables that can affect a balanced ecosystem. The orthodox view of agriculture’s beginnings describes gatherers and hunters who eventually started to till. As more food was produced, fewer people died, population increased and villages and cities grew. As a consequence, the hunting and gathering way of life was short-lived. For Jackson, understanding humans as products of nature and not as products of civilization or agriculture is the key to being able to work with our natural environment. The root of our fall is inherent in the root of agriculture, Jackson believes, when cultivation grew from patches to field, from diverse production to mono-cultural production. He wouldn’t put an actual dimension on what distinguished patch agriculture from field agriculture but described it as a size humans could work with as opposed to a size they must work to master. “I think it is possible to return to a perennial grass lands systems that is at once self-supporting like the prairies or the forests and yet capable of supporting the current human population.” Promising results from the Land Institute’s experiments, into perennial seed crops are detailed in their newsletter, The Land Report. Perhaps Jackson is right that industrial society as we know it is doomed. It is more than likely that those who attended the People, Land and Community conference would agree. But they didn’t come as prophets or seekers of doom. In fact, they represented among the most active and optimistic workers for a sustainable future in our country. John and Nancy Jack Todd of the New Alchemy Institute were there, along with Mary Catherine Bateson, daughter of Margaret Mead, Louise and Samuel Kaymen of The Rural Education Center and John Applegath of the Human Economy Center. Neither Robert Rodale or presidential advisor John McClaughry spoke for long, but both stressed the need to increase regional food self-sufficiency. Rodale’s Cornucopia Project (New Roots Holiday 1981) is a good example to follow. McClaughry, who has a long history of involvement in the decentralist movement, promised to re-double his efforts to convince the Agriculture Department that it is sound policy to support small farmers and those who want to return to the land. It will be interesting to see what influence he can exert in his role as Executive Secretary of the Cabinet Council on Food and Agriculture. A change in how we perceive our role in the world is also in order, Henderson warned. We are not stewards of the land (that description implies dominion and greater wisdom), but servants of it. We must learn to let go of our need to be in control, to maintain order, to predict and quantify everything. Our consciousness can greatly expand if we acknowledge nature’s greater intelligence. Wendell Berry, in a voice that mesmerized and in words that eloquently conveyed his love of farming, described a cycle of life that industrial society has forgotten. People are joined to the land by work, and people are joined in community by work, he said. But good work is not possible with just good intentions or even with lots of information. Good work takes time and love. We cannot possibly have enough information to work with nature sustainably, Berry pointed out, so we must work with an understanding of its harmony—of its natural integrities. 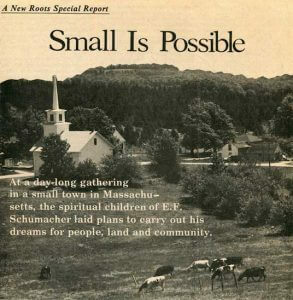 E. F. Schumacher would no doubt have been delighted by the gathering, which served to say that small is not only beautiful, it is possible. In his last book, A Guide for the Perplexed (Harper and Row 1977), he wrote a passage which Pat Sackrey delivered as an epilogue to the People, Land and Community gathering. The following is a list of resources for further investigation into the problems of people, land and community. Shortly after the death of E. F. Schumacher, a few of his British friends organized the Schumacher Society to honor his memory. From its beginnings, the British Society has sponsored a series of lectures by eminent thinkers and activists who are developing the ideas and practices that Schumacher advanced. At the suggestion of Satish Kumar, editor of Resurgence, an excellent British magazine with which Dr. Schumacher was closely associated, the Schumacher Center was established in 1980. Small is beautiful, with its emphasis on manageably sized institutions and communities, and regional and community self-reliance. The nobility of work and the necessity of having good work for the proper development of individuals and the communities in which they live. Intermediate technology, technology with a human face and human scale—locally controlled for local purposes and using local resources. Care and preservation of the world’s forests and woodlands, a more specific but no less important goal that EF. Schumacher stressed in his later years. Recognition of a higher power, whatever name one wishes to give to that power. This theme overshadows everything else in Schumacher’s writings.